Jackson Heights assistant principal Joel Hesed has been named the new principal at Royal Valley High School, taking over for Jim Holloman, who is retiring at the end of the current year. Learn more about Hesed in today’s edition. Students involved in the “Safe 75 Initiative” have gotten the attention of Kansas Governor Laura Kelly in their drive to encourage safety improvements on U.S. Highway 75 north of Holton. 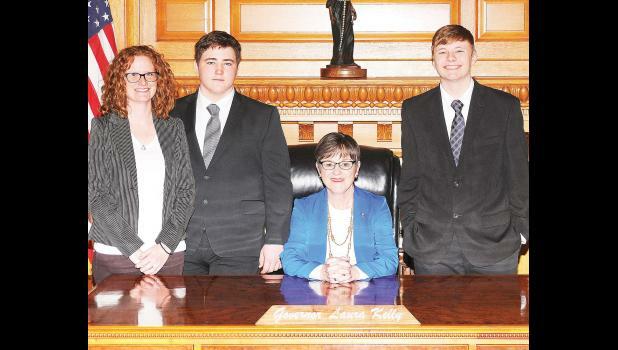 We’ll tell you more about the students’ meeting with the governor in this edition. A lawsuit is being considered against the builders of the new Holton Elementary School in regard to the “blue water” issue in the new school’s copper water lines. Find out what the Holton school leaders are seeking from the firms who built the new school. Holton’s summer street crew won’t be working on restoration of one of Holton’s brick streets this summer, as the Holton City Commission learned on Monday. Learn more about what Holton’s street department has in store for this year as part of its 2019 street programs. Also, find out who’s been named the new Banner Creek Reservoir director and more in today’s edition; log in to your holtonrecorder.net account and check the E-Edition tab for more.